There was a problem with calibration of timing gear on main track and the 14 runs from the morning were disappointingly not recognised. Racing resumed in the afternoon after the problem was diagnosed and rectified. Ran without incident for the entire afternoon session. The morning session ran very smothly and it was not until the late afternoon that a degradation in the track surface caused the track to be closed. This was after several spins between the 2 and the 3 mile. A decision was made to "flip" the track and a new track was created to the east of the existing track. Track layout was completed in the afternoon, but racing did not recommence. Afternoon weather report 34 and 4kph from the SW.
Main track closed in the morning to finish set up and do a emu run and a lovely bag of assorted goodies and salt encrusted branches were collected. Track opened after lunch. Main track condition was very good and got better as the day went on. GPS track closed at 11.00am as it ws no longer required. During the morning the main track continued to get lumpier around the 2 to 3 mile. With a track inspection in the late afternoon. Weather report; in the morning was 17C wind at 7-9kph from the SW at start of day and in the afternoon was 28.5C. Weather at the start of the morning 14C with wind from the SE. 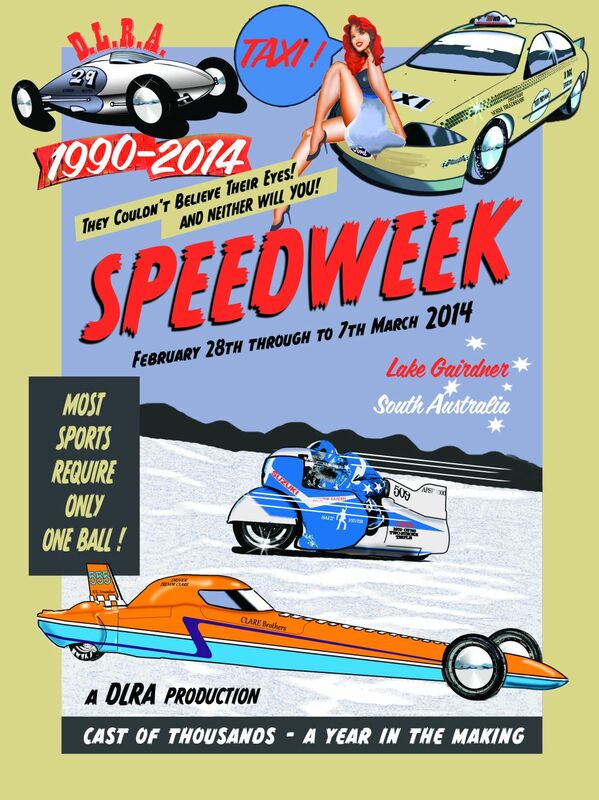 official Results of DLRA Speed Week, February 28th - March 7th 2014 - Paul Lynch, DLRA Chief Timer and Rob Cranfield GPS Starter. Record Speeds shown in BLUE are the highest speed attained for that class from all previous years or have never had a vehicle register a speed for that class and are considered Open. GPS speeds shown to 1 decimal place and are not recognised for records.